Today we’re back from summer break with another distillery visit recap. On our recent family vacation to the Big Island of Hawaii, we had occasion to pop over to Oahu for the day , so I made sure to visit Manulele Distillers, makers of the delicious Kohana rum–an agricole style rum made from the fresh juice of several different Hawaiian heirloom cane varieties. The whole family came along which was great fun, and the aloha from Manulele was boundless. Click here to read the article and see how Kohana rum goes from glass to glass! No, my dear. Not today. Barbados rum and tonic, please. Aged some years, ~80 degrees. Over ice in a highball glass. A nice dry tonic adds some class. Some lime as well, but just a squeeze. Keep them coming and hold my keys. Like my father and grandfather, I grew up around boats. You didn’t have to be rich to have access to one—they were just a way of life in New England. 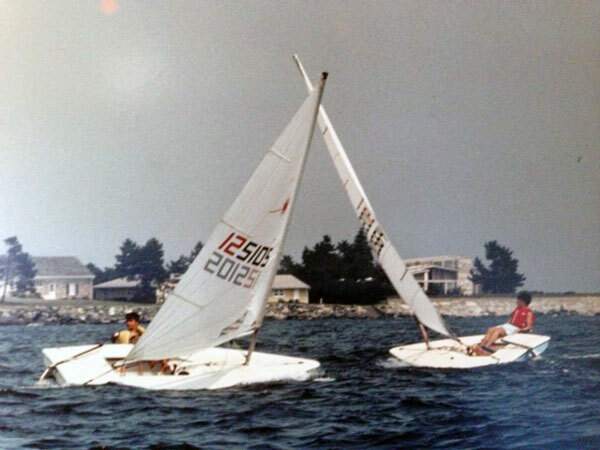 I used to teach kids how to sail at the local club and crewed for some of the racers there. Some skippers were really serious and some were quite casual, but after the races, one thing they all enjoyed was a good drink. I was in high school at the time, so I couldn’t fully participate in the post-race celebrations, but I did notice their predilections. One curious beverage some of these sailors enjoyed stood out in a world dominated by the macro beers of the 1980s, and that was the rum and tonic. The coolest among these sailors had red baseball caps from Mount Gay Rum. I later learned the only way to get one (at least back then) was to sail in the Round Barbados Race, a 70 mile circumnavigation of the island replete with tricky currents, shifting winds and some pretty big waves. 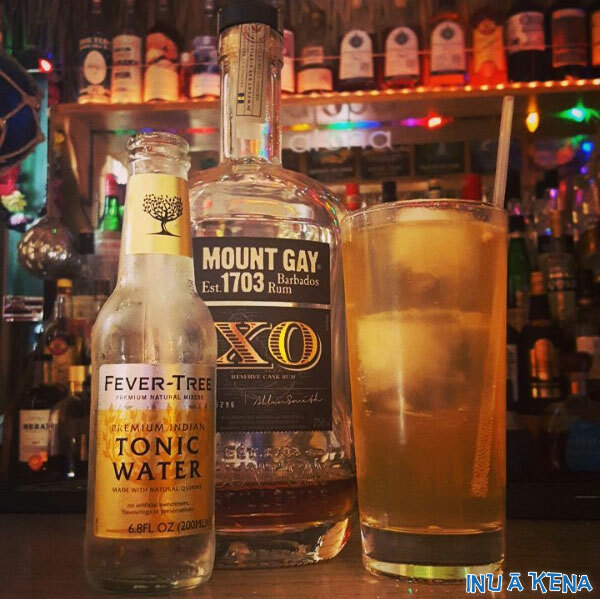 After a race like that, you need a drink to calm your nerves, and when Banks beer won’t cut it, many sailors in Barbados reach for a refreshing highball of rum and tonic. Mount Gay has long sponsored the race, so their Eclipse aged rum was often the most popular choice. As it turns out, rum and tonic is indeed quite good for mental soothing. But it also manages to be extremely refreshing while demonstrating a depth and breadth of flavor not typically found in simple highballs. Whereas gin cuts through tonic with a sharp juniper kick, a blended aged rum contributes loads of flavor while still managing to be nuanced. The tonic adds brightness, bitterness, and a bit of spice, so you could easily stop there and be quite satisfied. But depending on the tonic water you employ, a little additional citrus can provide much needed balance. Aged rum and tonic might not sound great to you, but you’re just gonna have to trust me and the guys in the red caps on this one. As my old sailing buddy Alex said a few years ago, “It turns out those sailors were onto something”. 1. After this article was published, a friend informed me that some Bajans refer to this drink as a “Slap in the Face”, as Chesterfield Browne described to a young Camper English back in 2009. 2. The original version of this article referred to rum from Barbados as “Bajan”. I have subsequently been reminded that the term “Bajan” is reserved for reference to the people of Barbados, while the term “Barbadian” is used for all other items. For ten more easy rum drinks you can make at home, check out this article. In a recent Facebook thread, sustainability in the spirits industry was the subject of a vigorous discussion. 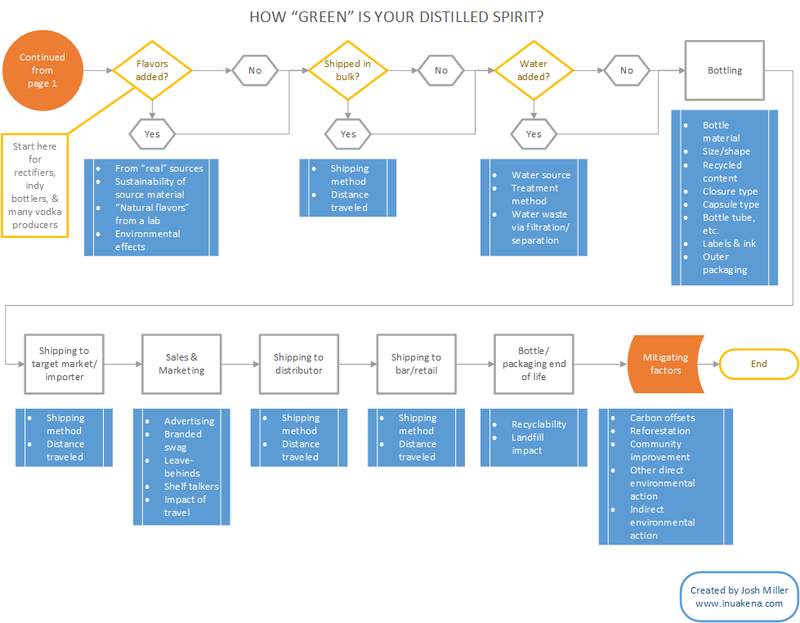 There were a lot of opinions about the “greenwashing” of the booze industry, and a general consensus that many brands and their ambassadors were promoting their products as sustainable, green, and eco-friendly, even in cases where that was not true. The question of sustainability is a complicated one, and in order to truly know if a particular product is sustainable, you need to ask a ton of questions. We are essentially talking about a product that starts out as a plant and ends up in a cocktail, often thousands of miles away from where it was produced, so to say it’s complicated would be a massive understatement. In the two images below, I’ve attempted to capture the relevant production steps where decisions are made that affect the environment. I have likely missed a few things in my haste, so please add your comments below, and I will release an edited version at a later date. 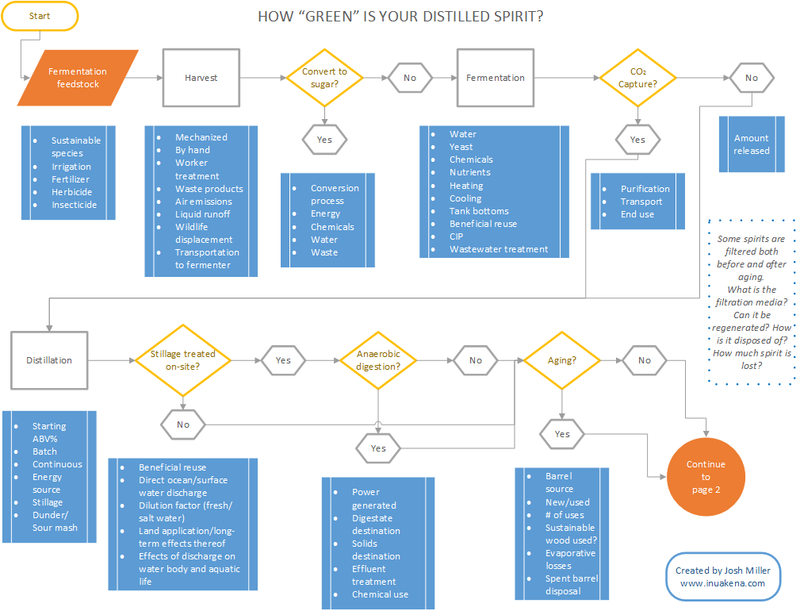 Despite any omissions, the flow sheets should nevertheless help folks visualize the steps in the process of getting booze from the field to the barstool, and provide some food for thought. Oh, and the next time you’re being pitched on a product’s environmental credentials, ask them about CO2 capture, anaerobic digestion, or how they process their spent wash or something. Their heads may very well explode! Today I finally got around to publishing an article that’s been kicking around in my head for a long time. As you can probably tell from the title, it’s an exploration of the impact of orange Curaçao and orgeat on the classic 1944 Trader Vic’s Mai Tai. I know plenty of people who have strong opinions on the rum(s) they use in the drink, but far fewer are as passionate about the orange liqueur or almond syrup they use. As for me, I’ve tried a lot of different combinations through the years, but I never did it methodically until now. So please join me as we try fifteen different Mai Tai permutations and see what really makes the drink sing. Sometimes a special bottle comes along and you wonder if the juice can live up to the price. I found myself asking that question of Appleton’s latest exclusive release, but I nevertheless took my first opportunity to procure a bottle. Joy Spence really knows how to make delicious rums, so an anniversary blend celebrating her two decades as Appleton Estate’s Master Blender would have to be amazing, right? You can probably see where this is going, but if you’re after some unbiased tasting notes, read them here. Today I am excited to share with you a review of a rum that is the successor to one of my “ah ha!” rums–one that made me develop a new appreciation for the category, and realize that there was more to rum than being round and supple. When I met with Mount Gay Master Blender Allen Smith on his most recent visit to California, I asked him if my beloved 1703 would be changed radically, and he assured me it was staying true to its original form. “Would the blend include younger rums”, I asked? “No, if anything the blend skews older” Smith replied. Continued Smith, “It may be a bit more smooth”, to which I replied “You know ‘smooth’ can be a dirty word to many rum nerds, Allen” before we both shared a hearty laugh. The thing about the first 1703 blend that made it so great was the fact that it managed to be round yet assertive–a tricky balance to strike. Would Allen be able to do it again? Read the review here and find out!